According to traditions, Hazrat Khadija(a.s.) was born in 565 A.D. and died on the 10th of Ramzan 3 years before Hijrah (migration from Makkah to Madina) at the age of 58. Khadija(a.s.) married earlier as well. 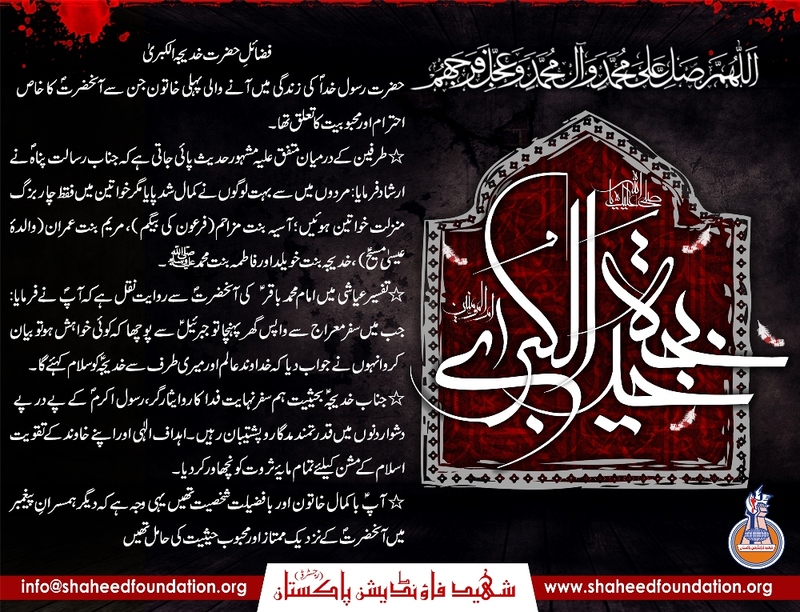 She was the distinguished mother of the leader of the women of Paradise - Bibi Fatima Zehra(s.a.). Munaf ibne Qusayy bin Kalaab. Hazrat Khadija(a.s.) was the wealthiest businessperson of the entire Arab region and after the declaration of Islam by the Prophet(sawaw) she dedicated all her wealth for the cause of Islam. She, along with Hazrat Abu Talib(a.s.) were the two people who helped our Prophet(sawaw) the most by offering their wealth and protection during the early part of Islam. That was the reason when both of them died one after the other in the same year, our Prophet(sawaw) was so grieved that he declared that year as Aam-ul-Huzn “ the year of sorrow/ grief. Hazrat Khadija (SA), the wife, the companion and the friend of Muhammad Mustafa (SAW), the Messenger of Allah, and the benefactress of Islam and the Muslims, fell ill. Her illness was brief and fatal. All her life she had lived in the midst of abundance and luxury but the three years of exile had been a time of excessive austerity for her which inevitably took its toll. She was the first woman to declare that the Creator was One, and that Muhammad (SAWW) was His Messenger. The glory and honor of being the first woman believer in the whole world, is hers to all eternity. When Islam came under mounting pressure from its enemies, Khadija (SA) sacrificed her comforts, her wealth and her home for it; and now it would appear that she sacrificed her life too, in the way of Islam. Without a doubt, if she had lived in her palatial house in Mecca, surrounded by her maid-servants, she might have lived for many more years. But she preferred to stand by her husband and his clan, and to share the hardships of life with them. During the siege, she had to endure not only the pangs of hunger and thirst but also the extremes of heat in summer and cold in winter; yet she never complained to her husband about them. Whether times were good or bad, whether she had plenty or she had nothing, she was always cheerful. Austerity and privation never soured her. It was this temperament that was an unfailing source of comfort, courage and strength for her husband during the blackest and trying moments of his life. During the years of the siege, Khadija (SA) spent all her fortune on buying essentials like food and water for the clan of her husband. When she returned to her house, her last cent was gone; and when she died, there was not enough money available in the house to even buy her shroud. A cloak of her husband was used as a shroud for her, and she was given a burial in it. Muhammad Mustafa (SAW) never took another wife as long as Khadija (SA) lived, and if she had not died, it is most probable that he would never have married any other woman. Khadija (SA) died on the 10th of Ramadan, 619 A.D. One month after her death, Muhammad Mustafa (SAW) had to sustain yet another shock in the death of Abu Talib (AS), his uncle and guardian, and the bulwark of Islam. The deaths of these two friends - Khadija (SA) and Abu Talib (AS)- were the greatest shocks that the Messenger of Allah (SAW) had to endure in the fifty years of his life. The two lamps of their glorious lives were extinguished. He was overwhelmed with sorrow. He called the year of their death as, "The Year of Sorrow" (Aa'm ul Hozn).